If Vidal (The Smithsonian Institution, 1998, etc.) isn’t the last wild man remaining in the American literary left, then it’s hard to say who is. At any rate, this little volume will certainly add to the novelist’s reputation in that role. In fact, the book looks like something that Vidal dashed off on his coffee break. 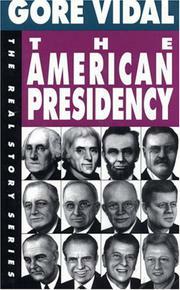 Consisting of the text of a three-part British TV series, with a brief afterword added, it’s an extremely condensed thumbnail history of the institution of the presidency, from its almost accidental beginnings in the aftermath of the Revolution to the office’s present-day decay into what Vidal gleefully dismisses as a glorified broadcasting job. “Currently, the American empire is governed not from the Oval Office, but from the White House TV studio,” he opines, a statement that recent events have done nothing to gainsay. Vidal regards the evolution of the presidency as a peculiar product of domestic paralysis—enforced by the powers of the rich and corporate—combined with a free hand in the realm of foreign affairs. As a result, activist presidents have tended to be those who concocted expansionist policies, usually to the sorrow of countries that were beneficiaries of a rather brutal form of American largesse. Scattered throughout here are small surprises, such as Vidal’s sympathy for Lyndon Johnson as a president genuinely concerned with a progressive domestic agenda, and his almost throwaway characterization of Polk as “intelligent, low-key.” Most of the time, though, the author giddily, flippantly slags off every occupant of the White House, from Washington to Bush—although he seems to maintain a certain odd affection for Clinton—in terms that run from the genuinely witty to the outright sophomoric. As a satirical novelist, Vidal is the nearest thing to Mark Twain. But as an essayist, he often leaves a lot to be desired. This is one of those times.